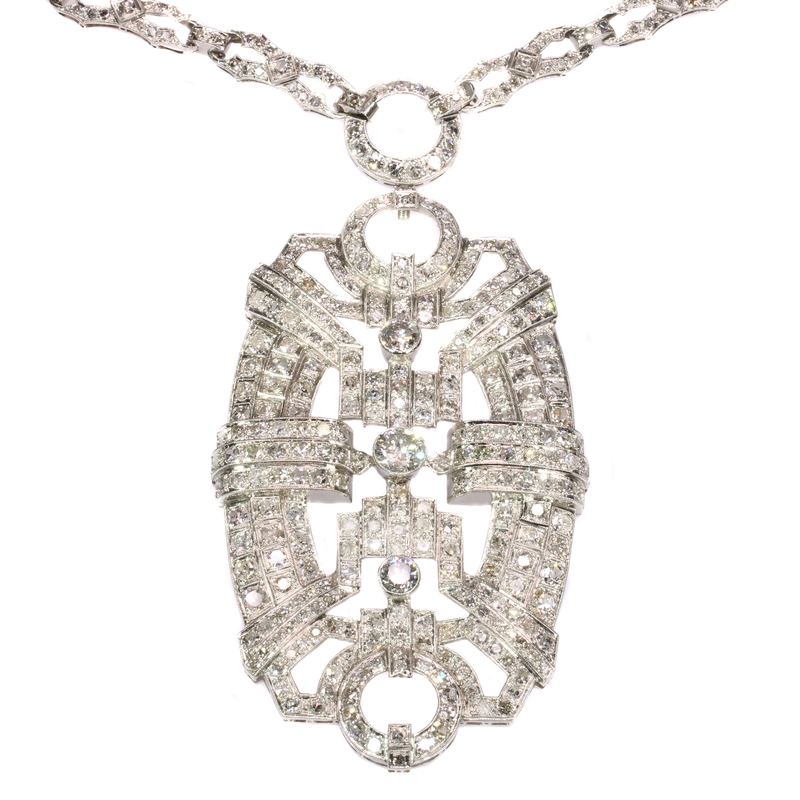 Art Deco platinum pendant necklace with 20+ crt diamonds necklace can be worn as 3 bracelets: Description by Adin Antique Jewelry. One old European cut diamond with an estimated weight of ± 0.95ct. Two old European cut diamonds with an estimated weight of ± 0.80ct. 268 old mine brilliant cut diamonds and single brilliant cut diamonds (also called 8/8) with an estimated weight of ± 10.92ct. in the three bracelets that together: 373 single brilliant cut diamonds (also called 8/8) with an estimated weight of ± 7.90ct. in the attachable ring that connects the pendant with the necklace: 13 single brilliant cut diamonds (also called 8/8) with an estimated weight of ± 0.70ct. Total diamond count: 644 pcs. Total diamond weight: approx. 20.57 crt. with an average colour and clarity: H/M, i1/i3.